Indeed, in addition to selling thousands of individual copies of SeeTree, Solid Software also sold numerous site and State-wide licences of SeeTree to State, Corporate and University entities in Australia, including: Curtin University (State-wide licence, WA), New South Wales (NSW) Education Department (State-wide licence), Monash Medical Centre (300 PCs), City of Waverley (20 PCs), Australian Road Research Board (130 PCs), NSW TAFE Department (State-wide licence), ACI Computer Services, NSW State Rail Authority (State-wide licence), ANZ Bank (State-wide licence, VIC), and other astute organisations. In the days of MS/DOS computers, software always came with a 'User Manual' in place of a web-site, a Blog or a Facebook page, no matter how usable it was. It it was missing a printed panual it was immediately considered an unprofessional software package (i.e. an 'app'). 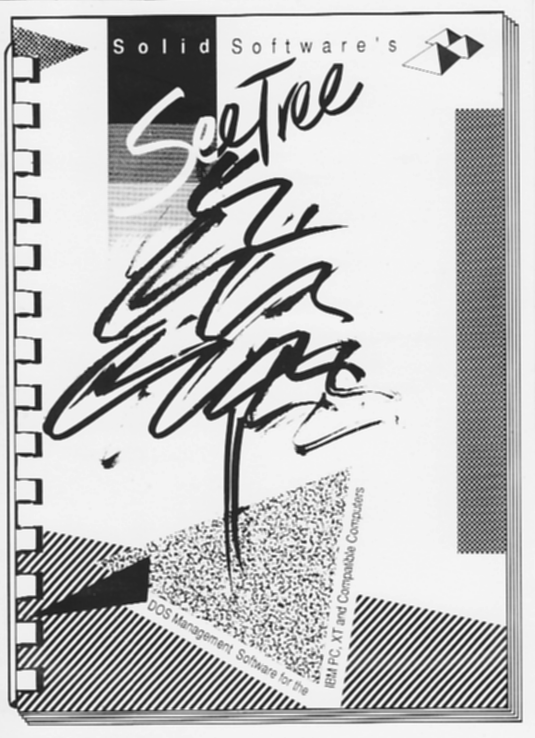 The artwork above was the original mock-up of the cover of the SeeTree manual. 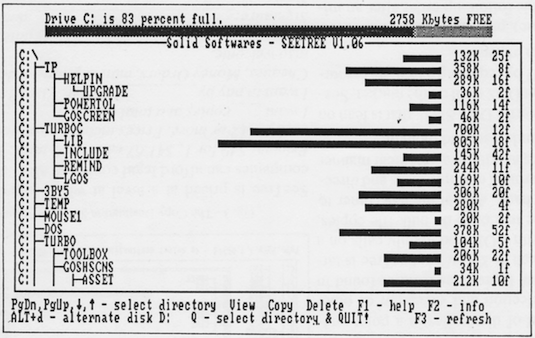 Figure 0 shows V1.06 from 1988 - the first version of SeeTree released for sale. While it allowed the user to easily locate, Copy, Edit, View or Delete files, other options were quickly added, including: Transfer files to another location, reName files, eXecute files; and at the directory level, create sub-directories (with MkDir) and rename sub-directories (RmDir). Plus the ability to take the currently highlighted file into a number of applications of the users choice, dependent on its file extension (e.g. .doc goes to MS Word), via a simple configuration file - making SeeTree one of the first file-to-application 'document-centric' File Managers available. Although SeeTree was designed to run on character-based displays, that didn't preclude the use of color. As can be seen in figure 1 above, yellow, blue, black and white were used to effectively partitiion the different areas, windows and panels of the screen, and to highlight the keyboard characters used to instigate commands - the equivalent of 'accelerator keys' in the GUI interfaces that followed in graphic windowing systems such as MS Windows and Mac OS9 and OSX. "In 1988 I was teaching a TAFE short course on MS/DOS and PCs to all-comers - Wharfies and Girl Fridays, through to Accountants and CEOs - and they used a file manager that simply tagged user-selected files with a diamond character. 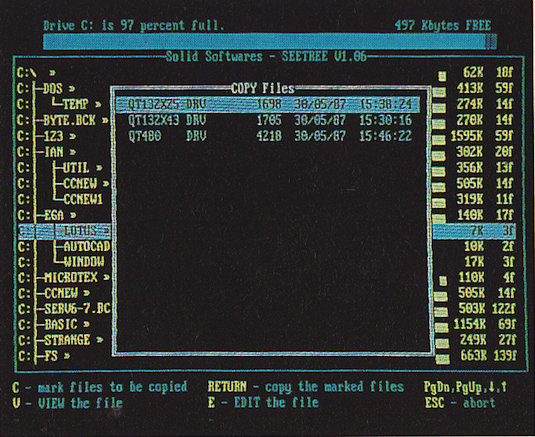 After they had tagged files, the program required them to then hit either the 'C' key to copy the files, or the 'D' key to delete them - I think it was XTree or maybe it was Norton Commander? If you look at any QWERTY keyboard you can see that the 'D' key is immediately above the 'C' key, and consequently many people that were new to the PC and to these less intuitive file managers (prior to SeeTree), often deleted files that they meant to copy! Which in turn led to some very unhappy customers." The design solution baked into the SeeTree interface was to display the actual character that the end-user used to select a given command (e.g. 'D' for Delete), as the tag itself, and so doubling up as immediate visual feedback. This was far more intuitive and led to 'happy customers'. In figure 4 above you can also see the use of Drive letters - 'C:' for the C hard drive, 'A:' for the first floppy disk drive, etc - on the lefthand side of the directory tree, for immediate visual feedback regarding where the current branch of a tree is, from 'A:' through to 'Z:'. This turned out to be exceedingly useful when network drives became popular and used many of those other characters in the 26 letter alphabet. Nov 01, 2013: ALthough there are currently no plans to develop a version of SeeTree for Android, we are experimenting with the code to see how much work would be involved in doing such an app. Customers who bought SeeTree prior to the existence of App Stores (e.g. our earlier MS-DOS version), will be represented in our client database. We do not pass on any information from our client database to any other organization or persons. The computers that run our client database, are in-house and are never connected to the Internet by either wire or wirelessly (no kidding).